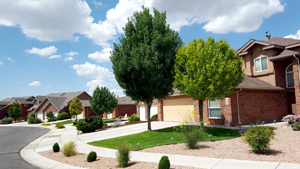 The Corazon neighborhood is one of two gated communities in Cabezon Rio Rancho located between the Astante’ and Arbolera del Este neighborhoods. Homes in this neighborhood offer a variety of features from brick exteriors, granite counter-tops, raised maple cabinetry to Jack & Jill bathrooms. A circular open space park is located in the southwest corner of the neighborhood. The Middle Linear Park Middle Linear Park runs along the eastside Corazon. The park amenities include a pedestrian trail with shaded seating structures. 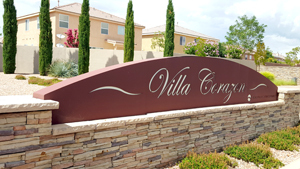 During the first half of 2018, the sales price of homes in Corazon ranged from $272,500 to $345,900. Why work with Syan Real Estate as your agent? View all available photos, home specifications and amenities. Create a custom portal to save your searches, get updates on listings, track listings and more. From Unser Blvd SE., turn east on Cabezon Blvd. SE. to Avenida Castellana. Turn northeast on Avenida Castellana to enter the Corazon gated community. Note: You will need a gate code to enter the neighborhood.